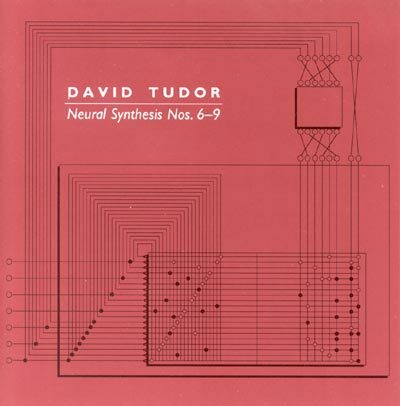 David Tudor used our neural-network synthesizer, Box #1, to record a 1994 CD, Neural Synthesis Numbers 6-9, available from Lovely Music. Forrest's cover art for the CD is shown below. The text of his introduction to the CD follows below. This recording combines the art of music, the engineering of electronics, and the inspiration of biology. In it, David Tudor orchestrates electronic sound in ways analogous to our biological bodies' orchestration of consciousness. The performance originates from a neural-network synthesizer conceived and built specifically for David. He surrounds this synthesizer with his own unique collection of electronic devices, and in the recording on this CD made for headphone playback, he uses a new binaural technique for translating sound into out-of-head localizations in which sound seems to originate from specific, changing points in a space around the listener. The concept for the neural-network synthesizer grew out of a collaborative effort that began in 1989 at Berkeley where David was performing with the Merce Cunningham Dance Company. I listened from the front row as David moved among interconnected electronic devices that filled two tables. He created a stream of remarkable sounds, overlaid them, filtered them, and fed them back upon themselves until the stream became a river. His attention moved from device to device, tasting and adjusting the mixture of sound like a chef composing a fine sauce of the most aromatic ingredients. I was spellbound. At the intermission I proposed to him that we create a computer system capable of enveloping and integrating the sounds of his performances. We began meeting in New York to explore ideas. David had collaborated with a great many artists, scientists and engineers over the past decades to create performances on both an intimate and a grand scale. He put me in touch with many of them as our ideas took shape-people like John Driscoll, Phil Edelstein, Ron Kuivila, Billy Kluver, Max Neuhaus, Nic Collins, Lowell Cross, Carson Jefferies, Ivan and Serge Tcherepnin, Pauline Oliveros, Larry Shaw, Bob Bielecki, Bill Viola, Bill Hearn, Dana Massie, and-just months before their passing-John Cage and Fred Waldhauer. All of them contributed ideas enthusiastically. All said essentially the same thing about David's approach to music: he seeks to shape sound in all its dimensions, without limitation. The unfolding of our ideas was an adventure in discovery and like all real adventures it led to unexpected places. What began as an effort to integrate the proliferation of electronic devices in David's performance environment ended in the addition of yet another device. In an early phase, Ron Clapman of Bell Labs and I explored designs using PBXs and pen-on-screen interfaces to switch a broadband matrix of analog and digital signals, including not only audio but video and performance-hall control signals. This led us to think about parallel processors with rich feedback paths. In 1990, the project took a fundamental turn when I met Mark Holler from Intel at a computer architecture conference near Carmel, California. Mark was introducing a new analog neural-network microchip whose design he had recently managed. The chip electronically emulates neuron cells in our brains and can process many analog signals in parallel. It seemed a perfect basis for an audio-signal router, so I approached Mark with the idea during a walk along the Pacific coast beach. He thought it could work, offered a chip for experimentation, and we struck up an immediate friendship. Soon after, another colleague, Mark Thorson, joined us to work out the first hardware design for what was to become not only a signal router but also the analog audio synthesizer that David uses in this performance. Throughout our research and development, David provided a guiding light. His artistic intuition and his experience with electronic performance helped shape our thinking at each step. The neural-network chip forms the heart of the synthesizer. It consists of 64 non-linear amplifiers (the electronic neurons on the chip) with 10240 programmable connections. Any input signal can be connected to any neuron, the output of which can be fed back to any input via on-chip or off-chip paths, each with variable connection strength. The same floating-gate devices used in EEPROMs (electrically erasable, programmable, read-only memories) are used in an analog mode of operation to store the strengths of the connections. The synthesizer adds R-C (resistance-capacitance) tank circuits on feedback paths for 16 of the 64 neurons to control the frequencies of oscillation. The R-C circuits produce relaxation oscillations. Interconnecting many relaxation oscillators rapidly produces complex sounds. Global gain and bias signals on the chip control the relative amplitudes of neuron oscillations. Near the onset of oscillation the neurons are sensitive to inherent thermal noise produced by random motions of electron groups moving through the monolithic silicon lattice. This thermal noise adds unpredictability to the synthesizer's outputs, something David found especially appealing. The synthesizer's performance console controls the neural-network chip, R-C circuits, external feedback paths and output channels. The chip itself is not used to its full potential in this first synthesizer. It generates sound and routes signals but the role of learner, pattern-recognizer and responder is played by David, himself a vastly more complex neural network than the chip. During performances David chooses from up to 14 channels of synthesizer output, modifying each of them with his other electronic devices to create the final signals. He debuted the synthesizer at the Paris Opera (Garnier) in November 1992 in performances of Enter, with the Merce Cunningham Dance Company. In the 1994 recording for this CD, made during later experiments with the synthesizer in Banff, four discrete channels representing 12 recorded tracks are mixed to stereo. Audio oscillators have a subtle but long history in Silicon Valley. Many local engineers date the beginning of the semiconductor industry to the 1938 development by Bill Hewlett and David Packard of their first product, an audio oscillator, in a downtown Palo Alto garage just a few blocks from the studio in which this synthesizer was built. Our work in 1993 and 1994 with David Tudor has led to the development, principally by Mark Holler, of a second-generation synthesizer built around multiple neural-network chips. It is a hybrid system using the analog neural-network chips to produce audio waveforms and a small digital computer to control neuron interconnections. The analog waveforms have frequency components ranging up to 100kHz and are much more complex than can be produced by a digital computer in real time. The performer will use the computer to change tens of thousands of interneuron connections during performance. The space of possible interneuron configurations is so large that it is difficult to reproduce the behavior of the synthesizer, which can evolve sound on its own over time. Searching for the regions of configurations that produce captivating sound becomes the challenge. It is possible that, with further development, the computer may be useful in finding these regions. Until then, there is no substitute for David. The second synthesizer is still in its developmental stage. David and other colleagues continue their work with it. The recording on this CD presents the more mature first synthesizer. Its ability to generate captivating sound has become integral with David's handling of it in so many live performances throughout the world.